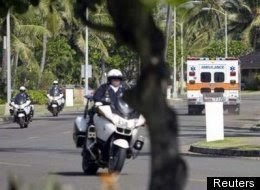 KAILUA, Hawaii — President Barack Obama has abruptly ended a round of golf and sped toward his family's vacation home for what is being described as a "personal matter." An ambulance was seen speeding toward their compound. White House aides said the speedy departure and return to the president's home was not a matter of national security or because of a threat to Obama's safety.